RIT is among the leaders of a consortium named as one of three finalists in the country competing for a multimillion-dollar federal investment in a regional photonics center. 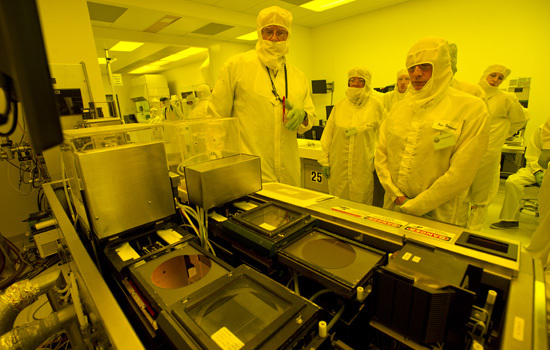 RIT assets in this area include the Semiconductor and Microsystems Fabrication Lab, shown here; the Center for Electronics Manufacturing and Assembly; RIT Nanophotonics Group; the Center for Detectors; and the IT Collaboratory. Rochester Institute of Technology is among the leaders of a consortium named as one of three finalists in the country competing for a multimillion-dollar federal investment in a regional photonics center. The application from the Research Foundation for the State University of New York, which includes RIT, University of Rochester, SUNY Polytechnic, Massachusetts Institute of Technology, University of Arizona, University of California at Santa Barbara and other academic and industrial partners, has advanced to the final round, Democrat New York Sens. Charles Schumer and Kirsten Gillibrand and Congresswoman Louise Slaughter announced. Full proposals are due March 31 and a winner will be announced in June, they said. Raffaelle said advancing photonics is essential to the nation’s manufacturing capabilities in such areas as high-speed data and telecommunications. These new technologies will allow for more information to be transmitted easier, faster and with less energy. “Rochester is home to the world’s greatest concentration of companies, university programs and expertise in the field of photonics, and this proposed partnership would further position Rochester as a global leader in this cutting-edge industry,” Schumer said in a statement. The application was in response to a program announced by Obama last October in which the Department of Defense will take the lead in constructing an Integrated Photonic Manufacturing Institute with a $110 million federal commitment, Slaughter said. “Today, we are one step closer to securing a federal photonics manufacturing innovation institute. I will continue to be relentless in my efforts to secure state and federal investments for an industry that is synonymous with Rochester because I know what it means for our economy and for local jobs,” Slaughter said in a statement. Earlier this year, RIT was named a core partner in the Chicago-based Digital Manufacturing and Design Innovation Institute and is slated for an investment of up to $20 million.